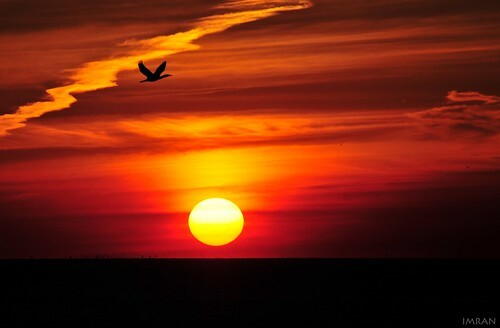 Sun (Good Night) Bird (Good Flight) – IMRAN™, a photo by ImranAnwar on Flickr. Tonight’s sunset over Tampa Bay, Florida, seemed to be one of the “usually unusual” beautiful experiences of nature. Something to be savored in the moment, and then forgotten, when the next beautiful night takes its place in the eye and the mind’s eye. But, as this unedited photo (taken with a handheld nearly six years old Nikon D300 and with NO color processing or tweaking) shows, the stunning natural subtle layers of clouds, in an otherwise clear evening, made crisper by a cold front coming through, just made for a magical incredible sight. The majestic bird taking off into the night sky, silhouetted against the darkening red sky and black horizon, made my spirit soar. I hope you enjoy it and share your thoughts, as the Sun says Good Night and the Bird takes Good Flight.